It was that time of the year that called for a celebration, fireworks, balloons, food and cakes were the order of the day..We bring you some of our celebs and how they ushered in the new year. "Just checked in family @Pearl of Africa Hotel. It's located in Nakasero next to All Saints church. This is where the best fireworks and performances will be in Uganda, It's the best place to have your family have fun on new year's eve. The Cool Ssali family wishes you all a happy New year.Thank you for supporting our music and cake business 2017. Keep up the love." 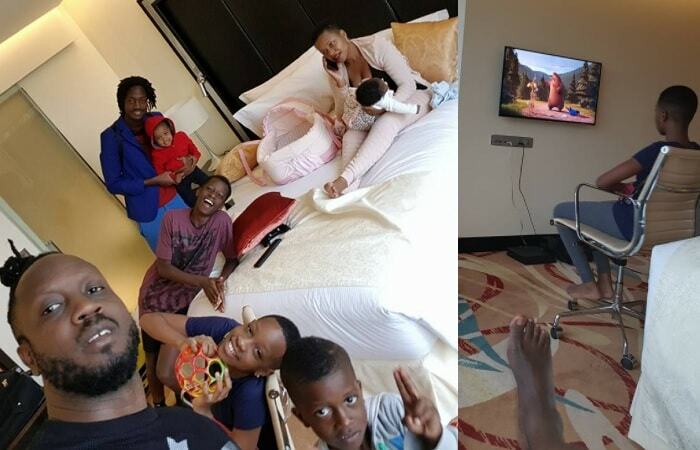 The True Love Singer, Desire Luzinda was with her daughter on new years at Pearl of Africa Hotel. It was a mother and daughter moment for her. Desire Luzinda - "I am a mother, a doting mother and I am proud of it. Regardless of my mistakes, nothing will separate me from the motherhood blessing that God graced me with and I embraced it. You can have it all but if you ain’t gat love ❤️ and the right people to share it with, you ain’t gat life. Let’s spread #love2018 because Hate only consumes you and your time. Happy New Year." Ex-Miss Uganda Sylvia Namutebi - "We had a great time celebrating the new year! Wishing you all the best in 2018." No doubt guitarist and singer, Irene Ntale, is one of the artists to look out for in the year 2018 and in her message she says, she is not going to kiss any frogs in the new year..
Irene Ntale - "Honestly Speaking, When this year started, I didn’t see how I would make it through, but here we are now and am more than grateful! This year brought forth lots of challenges and opportunities!! More often than not, I’ve been tried and I must admit, it was a tough ball But with support from God , my family , loyal friends and my lovely fans, I managed to channel My inner Strength and Pushed through! Gratitude fills the most part of me. Thank you sooo much for your undying support and interest in my Art! 2017 Goodbye  Welcome 2018"
Sheebah Karungi - "Happy new year my lovers  Thank you for the love and support, May 2018 be way better than 2017. I love you all. Let's keep winning, let's keep believing, Thank you God for the favour and the blessing of life." Spice Diana- We are too glad we made to 2018. A reason to celebrate. 2017 u have been great . I believe 2018 is going to be greater. Fille - I Can't Complain! God Has Been Good. As Always....The challenges, the trials, the tribulation all turned out to be my Victory in disguise...Am stronger, am wiser but most importantly am alive. Thank you so much for Raising The bar a notch higher this year. Thank you for the endless support...throughout the years. Blessings follow you. Fam...Happy New Year 2018 is gonna be a great year, I can feel it.."
Lydia Jazzmine - "We plan as the overall planner plans too. I Pray that all our wishes/plans/resolutions shall be granted and good health, favor, luck, love and peace be with us all. Happy fruitful and a prosperous 2018"
Lilian Mbabazi - "Happy New Year my loves, 2018 is going to be a great and blessed year... I wish you all more love, happiness and blessings..."
Barbie Kyagulanyi - "Finger counting new year resolutions and walking towards 2018 with no priorities yet. Happy new Year everyone. Much love and more blessings 2018"
Hamisa Mobetto - "Oh Dear .... just don’t make the same mistakes next Year To 2018." Winnie Nwagi - "There is so much to thank you for... Thank you lord, Who am I ? Glory be to the most high, Happy 2018 my lovely fans." Jose Chameleone - Thanks for the ultimate 2017 and the many years of support!! 2018 is the beginning of a next era, Great way to usher 2018 with my fans, friends family and partners in music crime. Happy new year all my people."